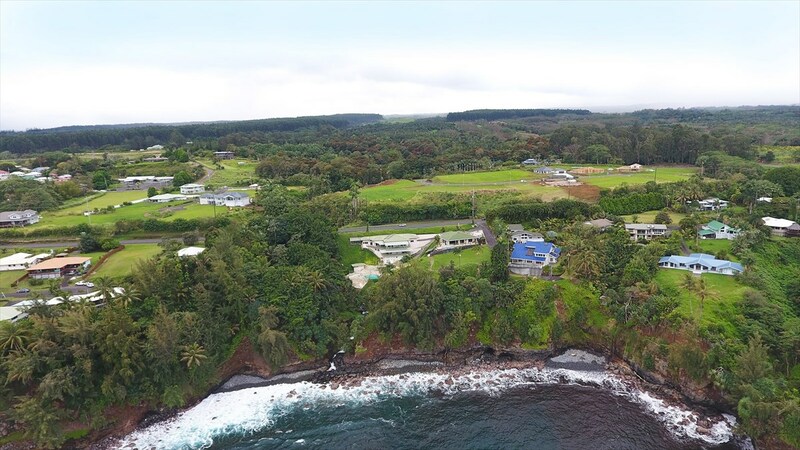 Located in the Honoli&apos;i area north of Hilo, on a cul-de-sac of beautiful designer homes, you&apos;ll find this spectacular turnkey single level custom home with unparalleled ocean views. 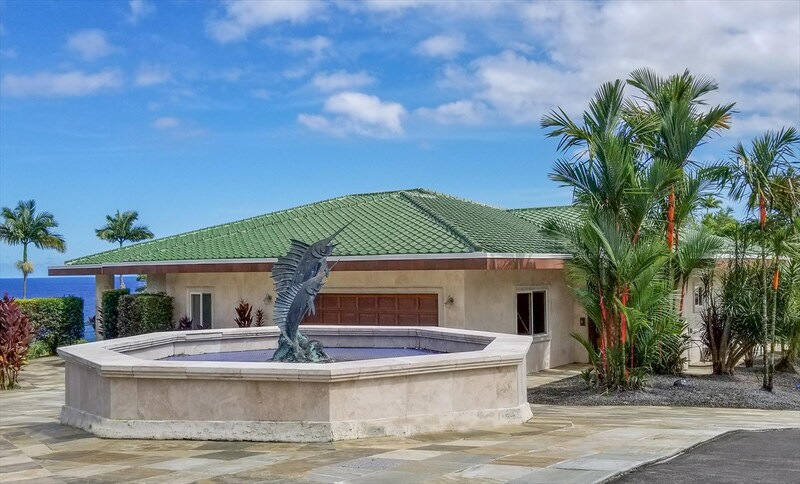 If you are looking for an extraordinary home with luxurious custom details throughout, located within Hilo city limits... look no further. 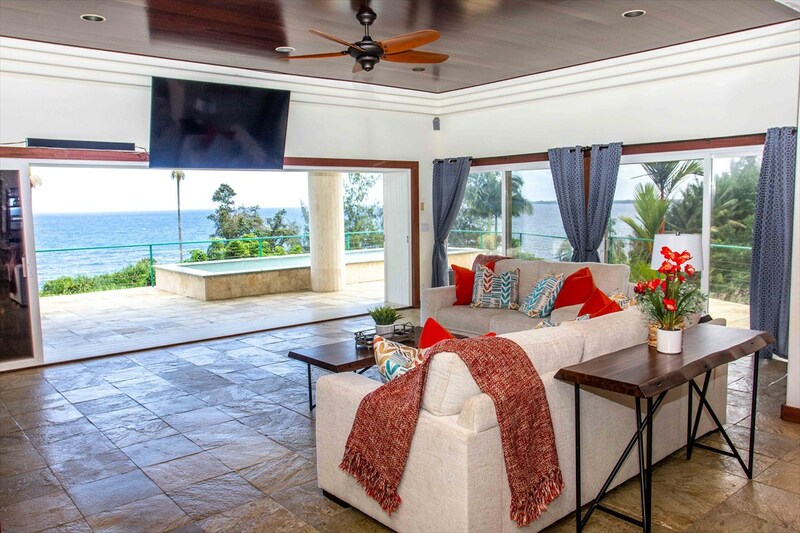 Telescoping windows make the front wall "disappear", and open the great room onto the spacious travertine-tiled lanai spanning the entire ocean-view side of the home. 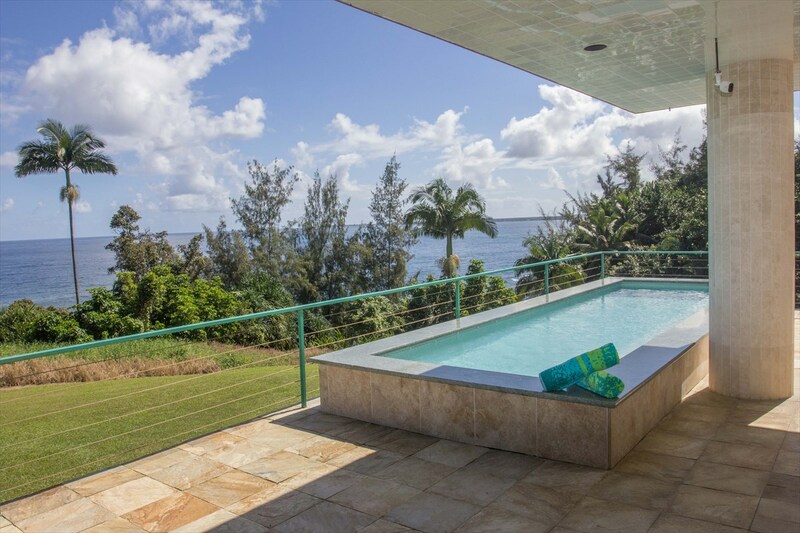 This provides extra square footage for indoor/outdoor entertaining while enjoying the views. 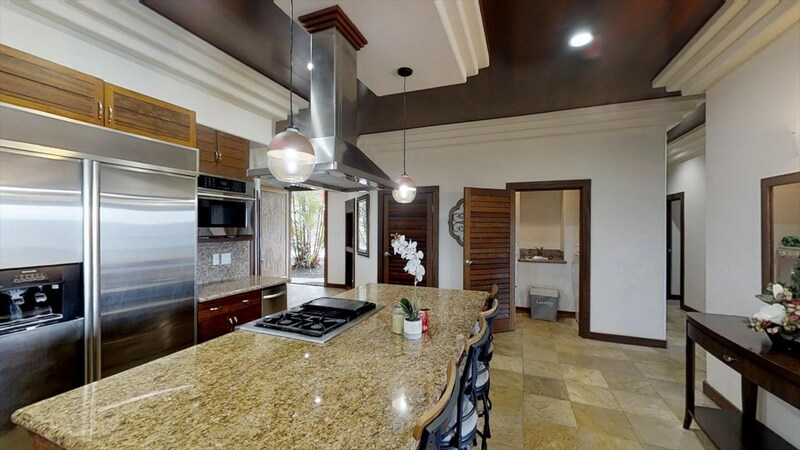 The open concept design has a central chef&apos;s kitchen, with thick granite counters, gas Jenn-Air range, stainless-steel appliances, and island seating for casual dining. 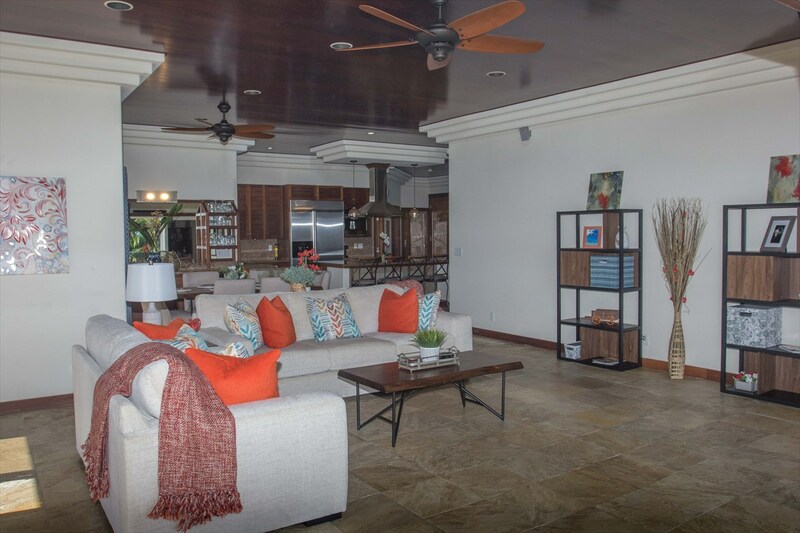 A dining area with dry-bar is adjacent to the kitchen, and open to the great room. 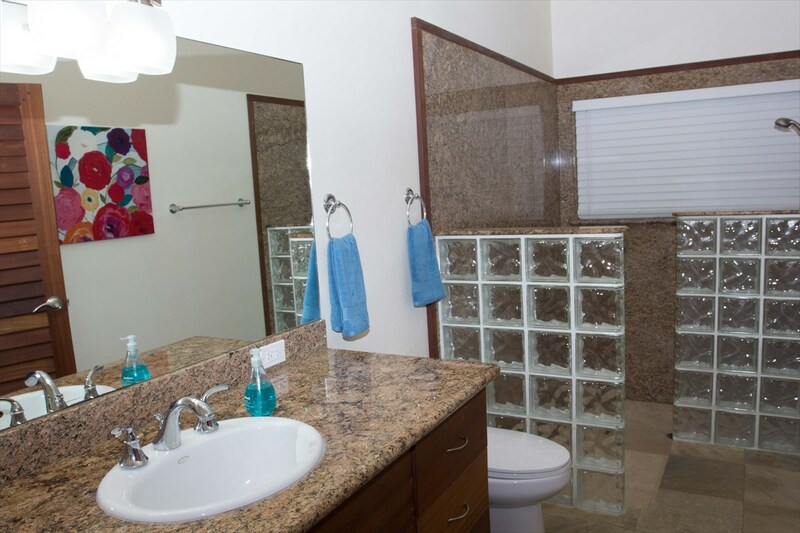 There are three bedrooms, each with en-suite baths. The clever design of the home also makes one of these baths a convenient powder room for guests. 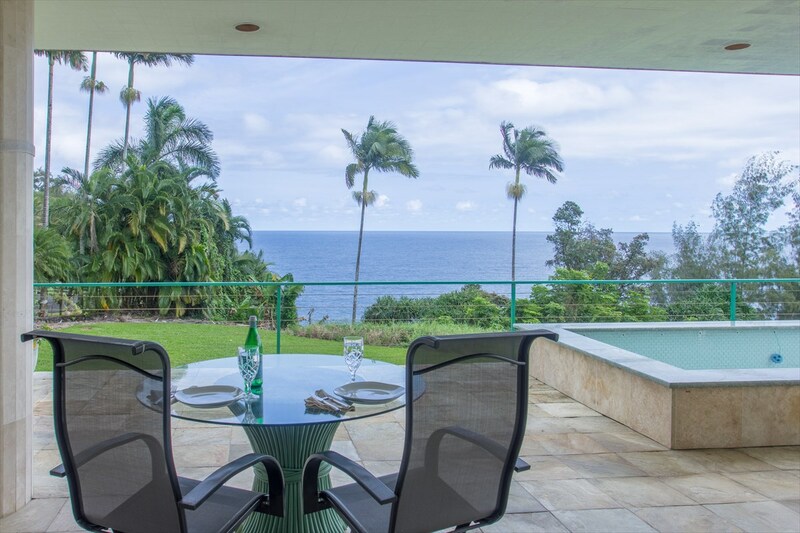 The master bedroom has large sliding doors that open onto the ocean-view lanai and a large cedar-lined walk-in closet. 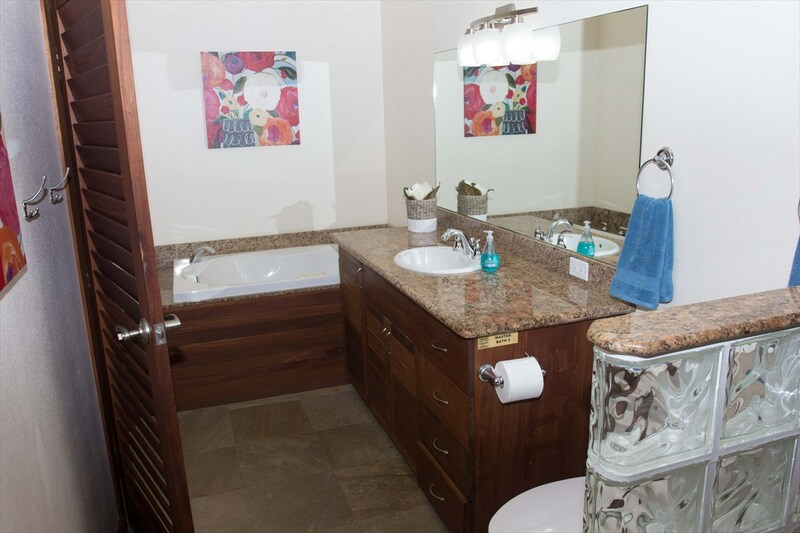 The en-suite master bathroom has a large jetted bathtub and a spacious walk-in shower. 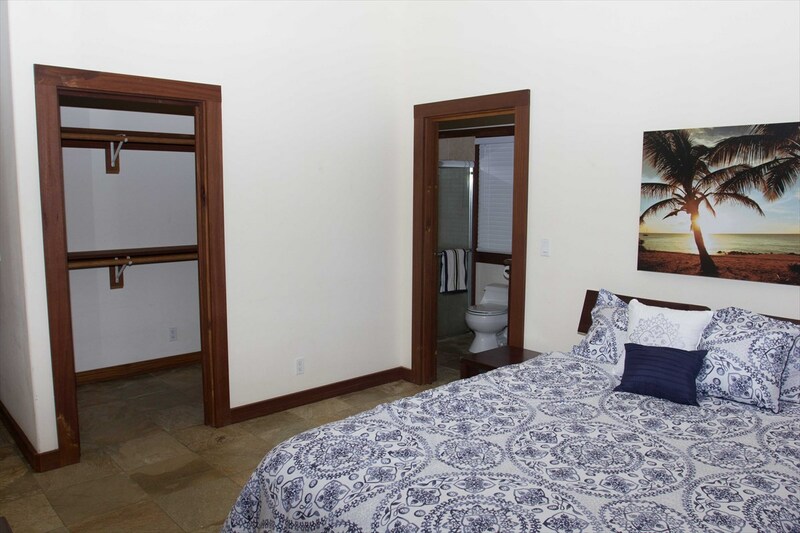 One guest bedroom has a walk in closet and en-suite bathroom. A second guest bedroom is located near the front of the home and could also function as a great home office. Cool easy care slate flooring runs throughout the home. 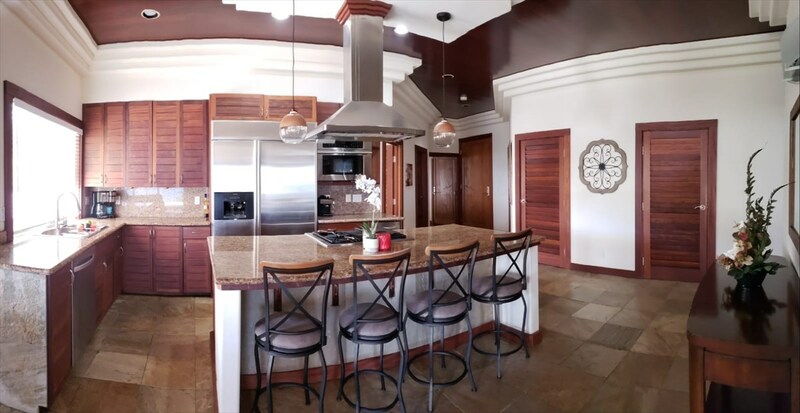 The ceilings have unique tray details with beautiful wood insets. The home has a 20 panel photovoltaic solar system, as well as solar water panels. There is also a security system in place. 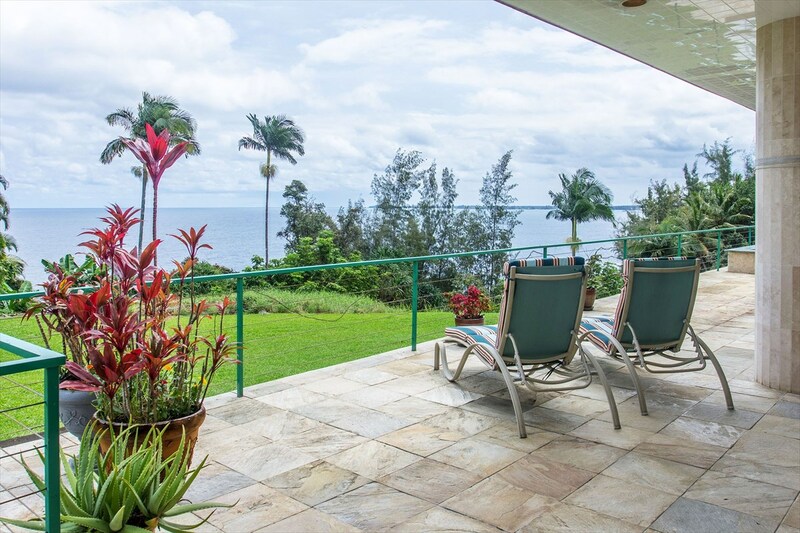 This home is minutes from Hilo Medical Center, downtown Hilo, the University of Hawaii at Hilo, and the Joint Astronomy Centers. County & tax records may not match number of bedrooms. 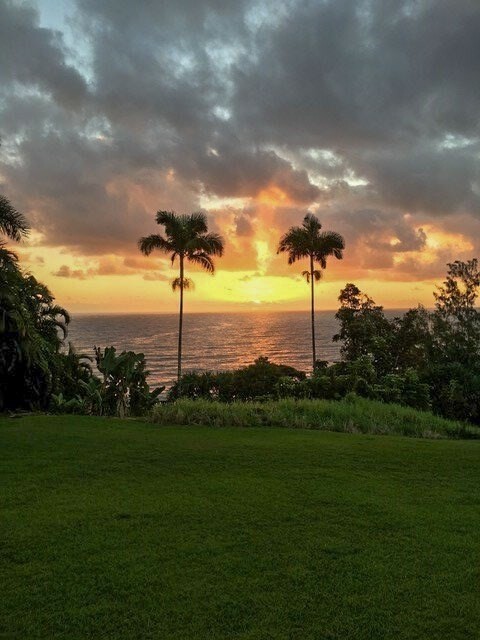 Located in the Honoli'i area north of Hilo you'll find this spectacular single level custom home with unparalleled ocean views. Enter through the large ornately carved custom wooden door, flanked by an artwork niche and a mirrored hall closet, not visible in photo. 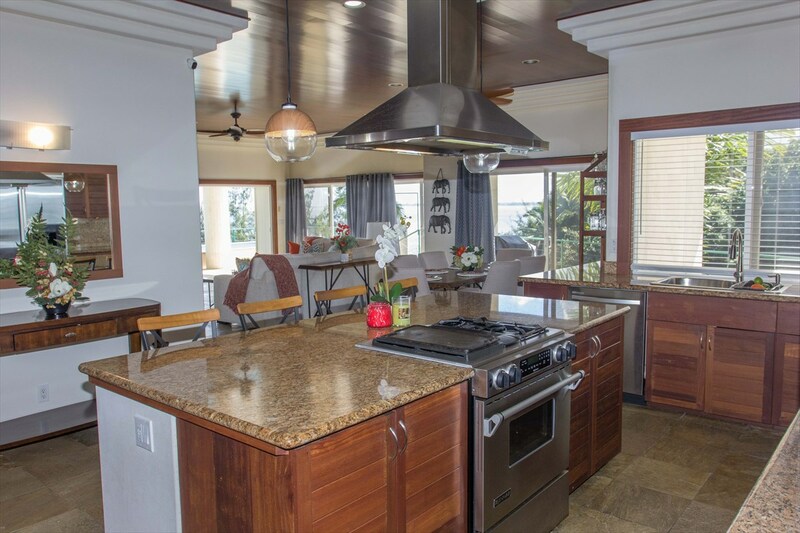 The kitchen has thick granite counters, gas Jenn-Air range, & stainless-steel appliances. 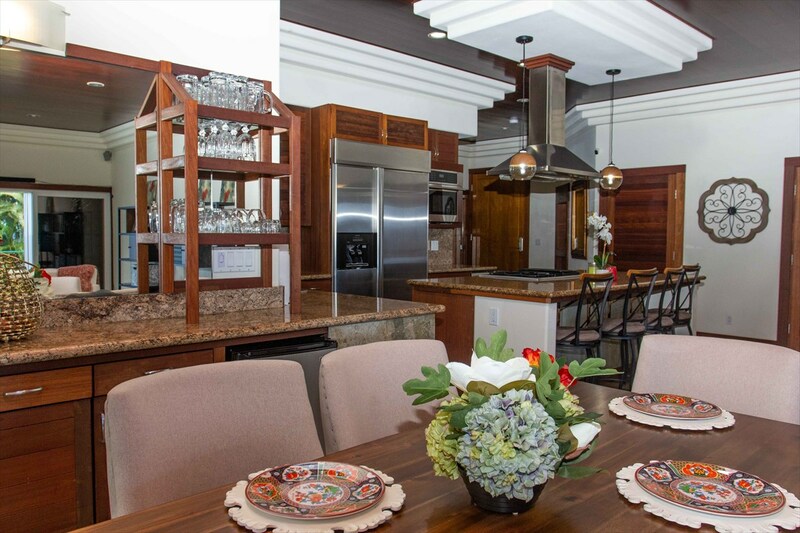 The chef's kitchen is open to the dining area and perfect for entertaining. A laundry room is visible through the open door on the back wall of this photo. 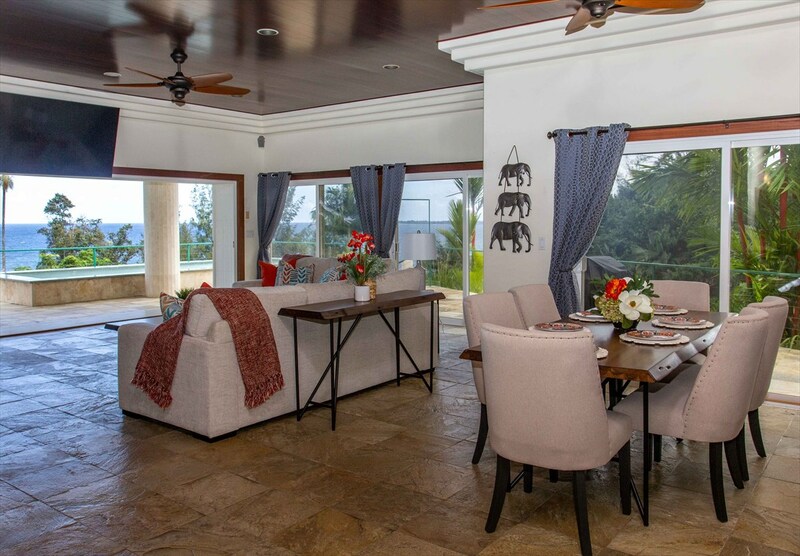 Island seating for casual dining. The dry bar with wine cooler and beverage fridge. 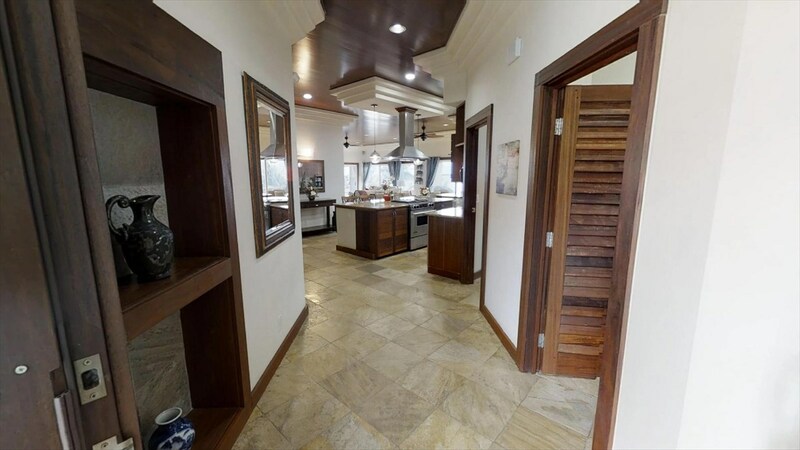 A dining area is adjacent to the kitchen, and open to the great room. Cool easy-care slate flooring runs throughout the home. Telescoping windows make the front wall "disappear". 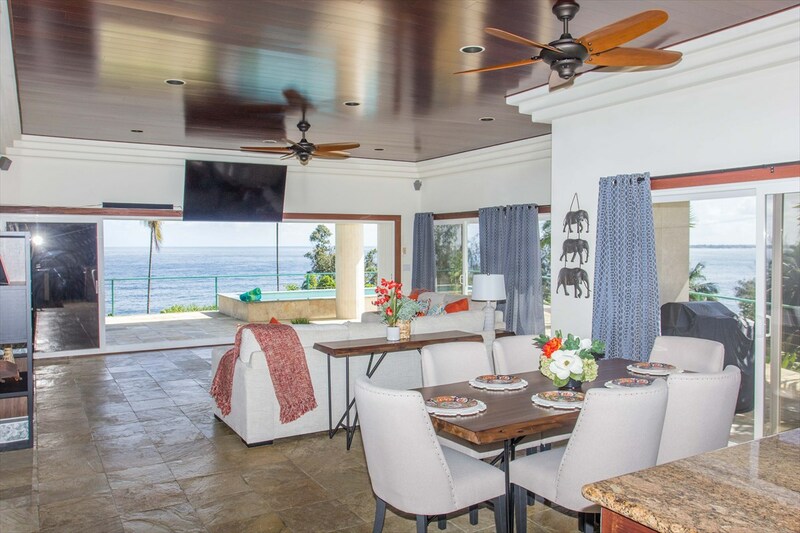 Open concept design with spectacular ocean view! 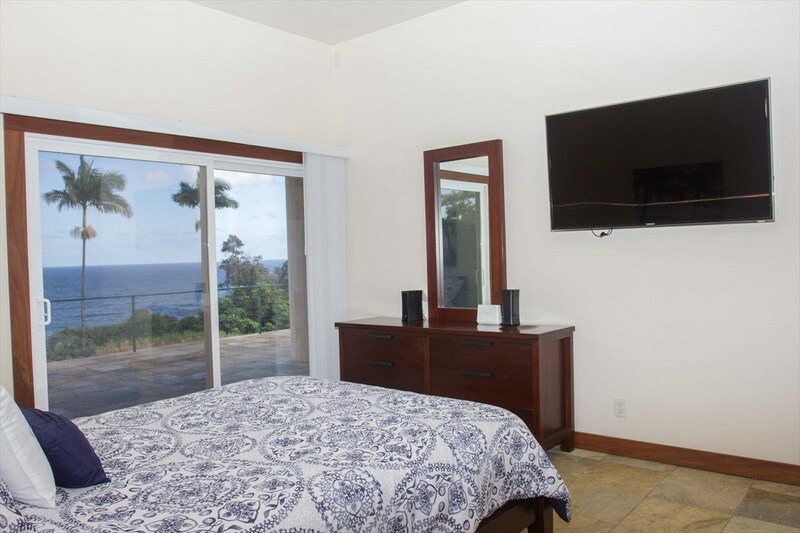 The master bedroom has large sliding doors that open onto the ocean-view lanai, as well as a large cedar-lined walk-in closet. ...and a spacious walk-in shower. 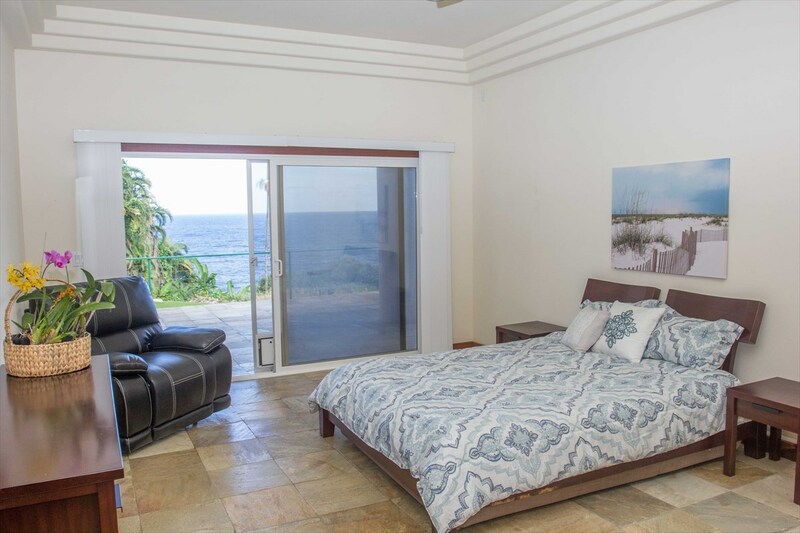 Guest bedroom with doors opening onto the lanai. 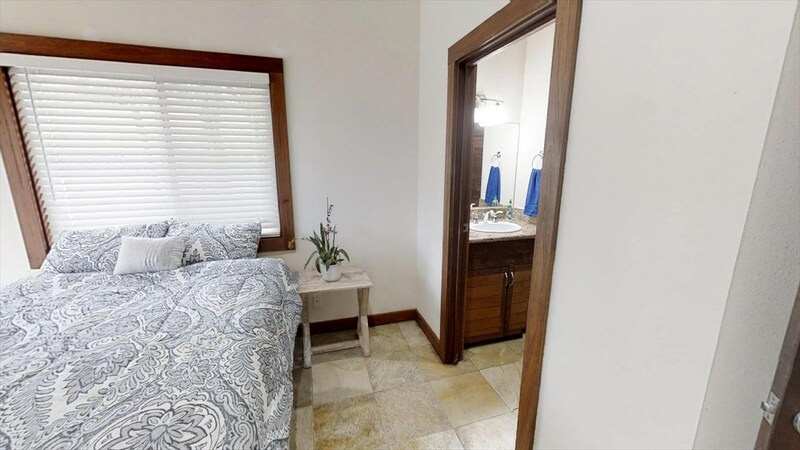 Guest bedroom has a large cedar-lined walk in closet and en-suite bathroom. A second guest bedroom is located near the front of the home and could also function as a great home office. 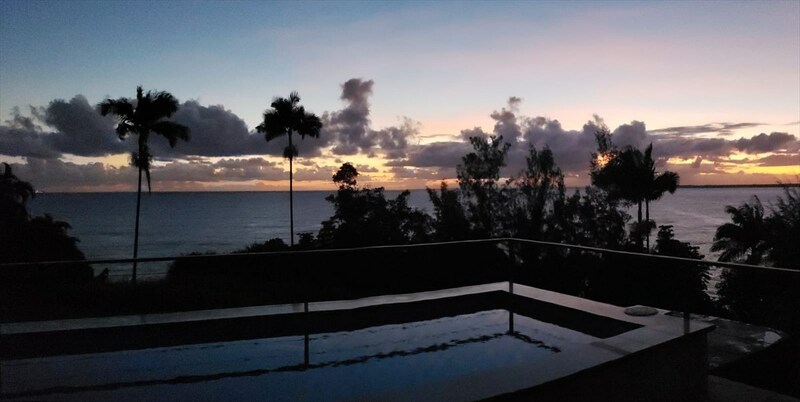 Beautiful sunrise views from the lanai. 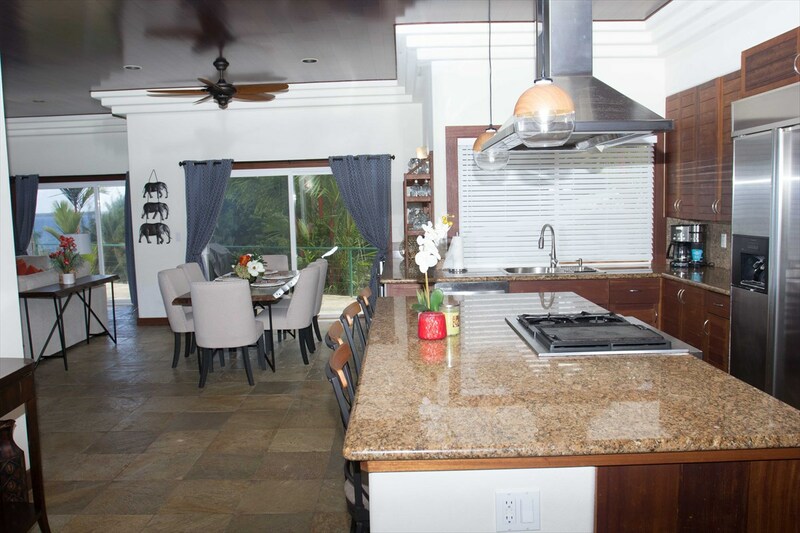 If you are looking for an extraordinary home with luxurious custom details throughout, look no further. 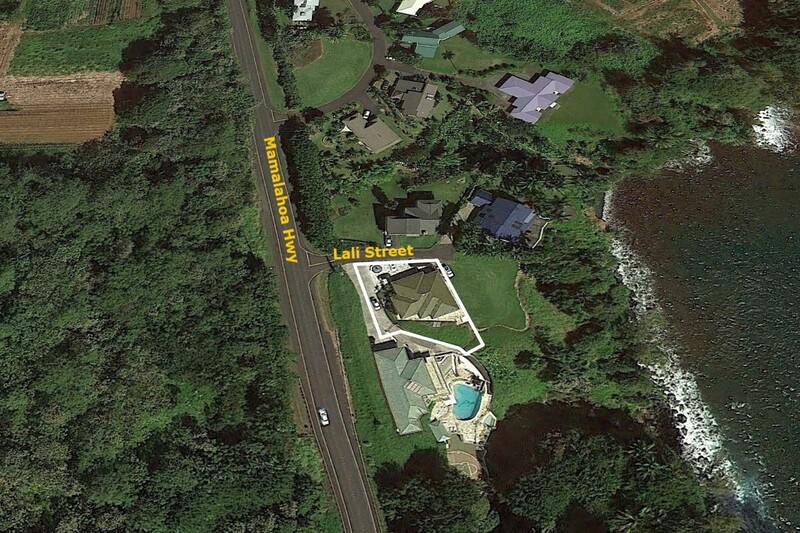 Aerial view of property shows proximity to the ocean. 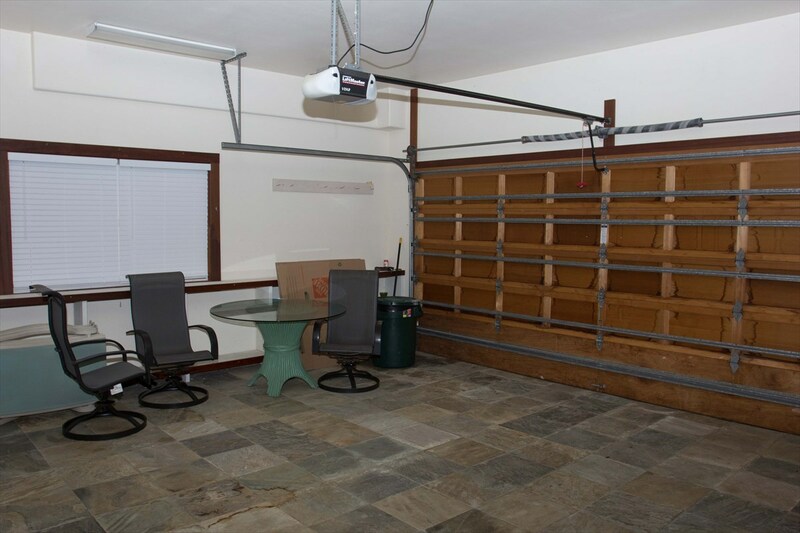 The double car garage with automatic opener is also tiled with slate. There are large storage shelves and a workbench built in.